The end of the swarm season was interesting this year! It lasted quite a lot longer into October than usual and a couple American swarms were reported in November. The past 5 years, a very few swarm reports have been submitted the first two weeks in October, so the late swarms this year were a good 2-6 weeks later than normal. The season started a few weeks late this year, too, and it stayed warm a lot longer into the fall in the east than typical, so there was a lot potentially coming into play here. 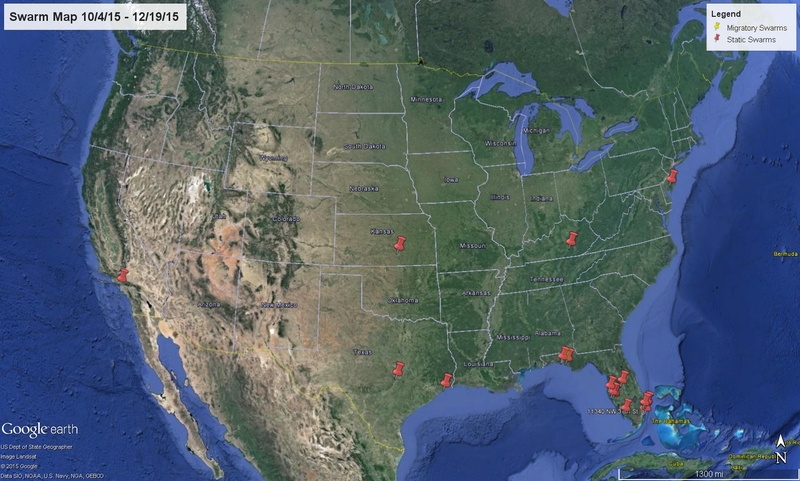 What’s really odd about this map is that there are three swarms reported from areas fairly far north much later in the season than I would expect them. Most of the swarms should be much further south by early October, so it’s very strange to see a swarm as far north as New Jersey that late in the year. There have been a few winter reports made from closer to the equator, from Belize and southern Mexico. These are normal, but it’s always exciting to see activity further south. Are the dragonflies they’re seeing the same dragonflies we saw in the fall? It’s impossible to tell with the way I collect data, but it’s fun to think that they might be. I totally dropped the ball reporting the annual findings last year, but I’m almost ready to post the findings from 2015. Look for the first post next weekend most likely! It’s been an interesting year. Thank you to everyone who has participated in the Dragonfly Swarm Project in 2015! I’ve got some exciting new opportunities coming up next year that I’ll share soon and I’m looking forward to the next season. In the meantime, if you see any swarms, I hope you’ll report them! This is a slow time of year, but I get a lot of very interesting reports from many sites across the world in the winter. I’ll gladly take reports!